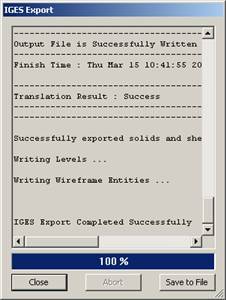 Select IGES from the File>Export submenu. You will be prompted to select the geometry to export. The Export IGES FIle dialog appears, through which you are able to name the export file and specify a directory to which it will be saved. Select the Options button (at the bottom of the dialog) if you wish to customize the output and/or add personal information to the file. Select SAVE when you are ready to export the data. A progress dialog appears as shown below.